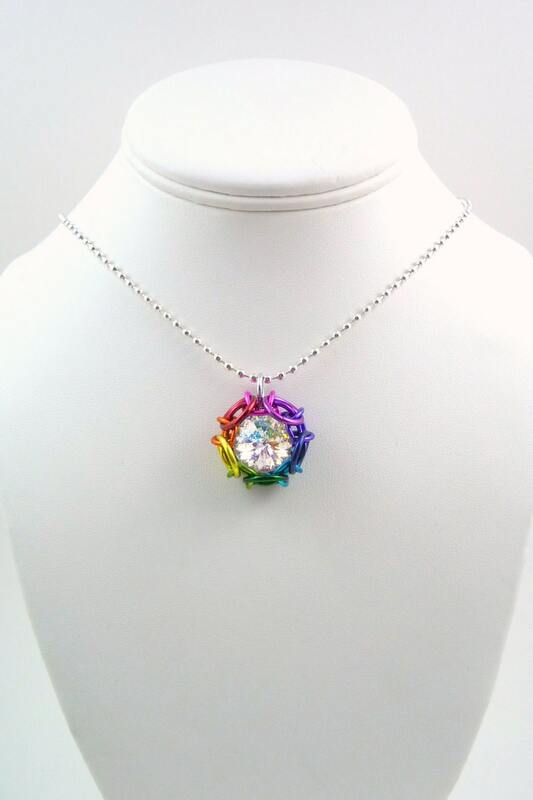 Luminous and colorful, these Phaedra© pendants are sure to draw a ton of attention. These pendants are delicate and durable and catch the light in dazzling array of colors. 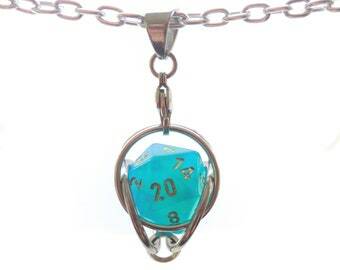 Pendant comes with a coordinating 24" nickel-free ball chain necklace. All our shipments come ready to gift in attractive silver boxes with cotton lining. My husband loves his present! He loved the d20 that came with it, but loves the fact that he can change it to whatever dice he wants to "charge" that day! :) Thank you for such a high-quality and fun piece of jewelry. Who Pays the Customs Fees for Shipments Outside the US? International customers are responsible for all fees associated with shipping to their respective countries. Orders that are shipped to countries outside of the United States may be subject to import taxes, customs duties and fees levied by the destination country. The recipient of an international shipment may be subject to such import taxes, customs duties and fees, which are levied once a shipment reaches your country. Additional charges for customs clearance must be borne by the recipient; we have no control over these charges and cannot predict what they may be. Customs policies vary widely from country to country; you should contact your local customs office for further information. When customs clearance procedures are required, it can cause delays beyond our original delivery estimates. All items can be returned within 30 days of receipt. If the item is defective, we will email you a pre-paid shipping label and we can either replace the item or refund the entire amount of your order, including shipping. If the item is otherwise not to your liking, we will refund the list price for the item and you will need to pay for the return shipping (although we are still happy to email you a pre-paid label and subtract the amount from the refund). We certainly want you to be happy with your purchase and if you in any way unsatisfied, please let us know and we will do all we can to make amends. We strive to turn around all orders within 48 hours, even custom orders. If you have any urgent delivery needs, please let us know when you place your order and we will do our best to meet your deadline. All orders are shipped US Postal Service First Class or US Postal Service International First Class. If you would like your order to deliver sooner, please email us at split.infinity.jewelry@gmail and we'll be happy to quote you a shipping price for the faster method. All domestic orders will be sent via a trackable method and the tracking number will be sent to you via email when your order ships. Unfortunately, we are unable to send International First Class mail with a tracking number (we're hoping PayPal will update their software soon), but if you have not received your item within two weeks of shipping, please let us know and we will resend the item. All pieces come in an attractive silver cardboard jewelry box. Each order is shipped with a receipt of your order. If this is a gift that is shipping directly to the recipient, please add a note when you place your order and we will omit the receipt. If this is a gift order, we are also happy to include a personal note from the sender. How Do Custom Orders Work? When you place a custom order with us, we want to make sure we create the piece to your liking. When you place your order, please be sure to list your color choices and any specific pattern requests. We will then make up a few mock ups of various versions of that style and colors and email the pictures to you. Let us know which one you prefer and we'll craft that piece! Also, while we strive to offer custom listings of all of our styles, if you are unable to find a listing that matches the custom piece you'd like to have made or you just have an idea for a piece that we don't currently carry, please just email us at split.infinity.jewelry@gmail.com and we'll be happy to set up a special listing just for you! If you have any questions that we haven't covered in this section, please feel free to email us at split.infinity.jewelry@gmail.com.